Do you have a favorite convenience food product? A go-to, gotta-have-it-in-the-fridge ingredient that you can’t pass up at the grocery store? Mine might well be Trader Joe’s soy chorizo. It’s so damn tasty and versatile! With just the right kick of heat, it’s a perfect protein-rich accompaniment to lots of recipes. I typically use it in a quick and easy potato and pepper hash with lots of onions and garlic. It’s a simple dish that makes a superb savory side for brunch, or even a quick dinner. 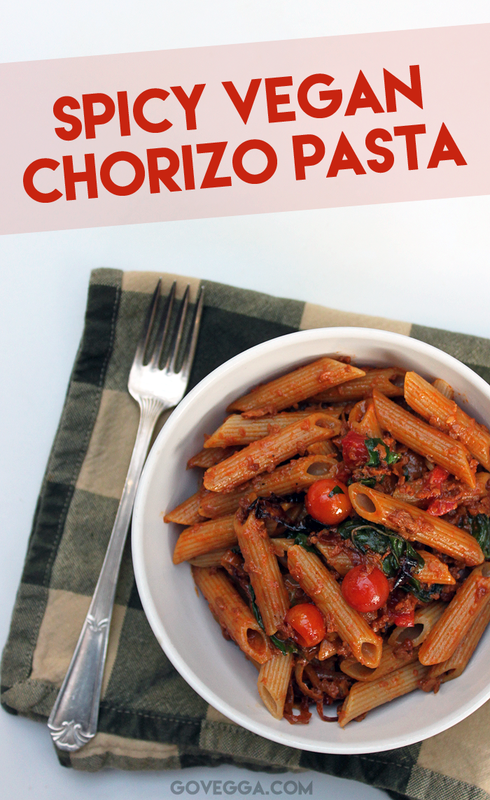 Recently, though, I decided to try something different with my chorizo and pair it with pasta instead. I’m so glad I did! The result was a spicy, belly-filling dinner that left both Steven and me well-sated. Another benefit? Unlike saucier pasta dishes, this one reheats well because there’s very little moisture to make the pasta soggy. Bam — tomorrow’s lunch is ready now. I leave the cherry tomatoes whole because I love the way they burst as you eat them, giving a little acidity to the dish. If you only have large tomatoes, feel free to chop them into small pieces and use those. If you’re looking askance at the inclusion of coconut milk, rest assured you can’t taste it. In fact, when Steven was cleaning up up after dinner, he asked me why there was an open can of coconut milk in the kitchen — and was thoroughly surprised when I told him that it was part of the meal he’d just eaten. First, start heating your pasta water. At the same time, heat the olive oil over medium and add the onion. Sauté for about 5 minutes, or until the onions start to become translucent, then add the garlic and tomatoes. Cook for another minute, then add the soy chorizo. (This can get messy — I recommend slicing it in half right through the package, then slicing the chorizo casing lengthwise with a knife and squeezing it into the pan. 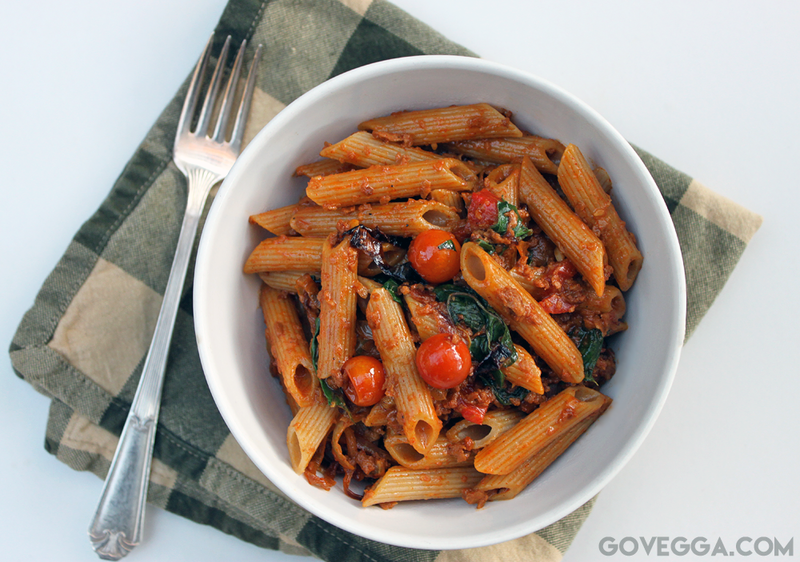 )If using kale or roasted red peppers, add now. Sauté for another 2-3 minutes and turn the heat down to low. Meanwhile, if the water is boiling, add the pasta and cook according to package instructions. Al dente pasta works best here. When it’s ready, drain it and set aside. Just before adding the pasta, pour in the coconut cream and stir to combine. Add the pasta and mix throughly, so the sauce coats the pasta. Let sit for about one more minute before serving. Go Vegga now has a Facebook page! Check it out here if you’re so inclined. I only post 2-3 times a week, so no worries about flooding your timeline. The Vegan Month of Food (aka Vegan MoFo) starts November 1st! Get ready for a whole month of daily food posts. This will be my eighth (!!!) year participating!